Allan Tissenbaum one of the best sprinter’s in the world, has come back from injuries from the past two years, and is now getting back into true running form. He displayed his talents this past month in Sacramento at the Outdoor Nationals. Allan, now 50 won the 100 meters in 11.39 and the 200 meters in 23.63. He joined his other Houston Elite members Marty Krulee, Greg Pizza and Rick Riddle to win the 4 X 100m relay in the age group 50 -59. 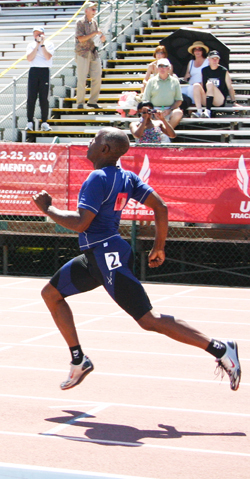 See below for the results from the 2010 Outdoor Masters Nationals Track and Field Championship. Charles Allie, one of the key members of the Houston Elite track club, once again put his one speed action into motion. He won all of his races in the 60-64 age group. Charles now 62 is running really well coming off a great indoor season. On Saturday night, July 24th at the Masters awards banquet he received his age group award for being one of the best athletes in 2009 for the age group 60 plus. Two other Houston Elite team mates also received awards, Phil Raschker (womens age group award 60 plus), Bill Collins (age group award 35-59). Charles time for 100 meters 12.48, 200 meters 25.91, 400 meters 55.37. Way to go! 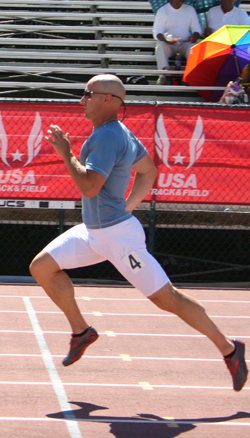 Jean Vander-Cruyssen and Rick Riddle both had outstanding performances at the 2010 Masters Outdoor National Championships. Jean got the show started with her big victory in the women’s 60-64 Pentathlon, she won three out of the five events. This was by far one of her best Nationals ever, and we are all so very proud of her. Rick has worked really hard this year, as he moved up from his normal 100 and 200 meter events to take on the 400 meters. His goal was to first get under 58 seconds, which is outstanding in it’s own right. Rick ran a PR in the finals of the 400 taking 3rd in a time of 56.93, great job Rick, you worked hard for it! Can you move on to 55 seconds?